A delightful, easy recipe to make as a quick snack, dessert or even to serve at a breakfast or brunch! 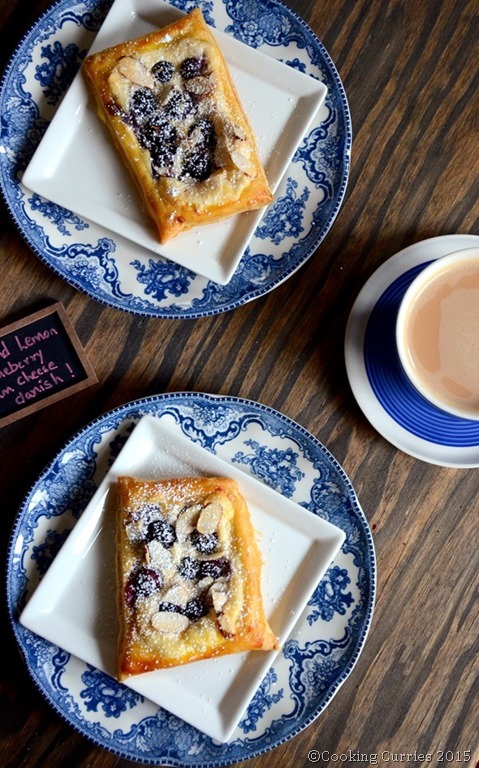 This Almond Blueberry Cream Cheese Danish will soon be a favorite! I don’t remember where I saw this recipe. It was either on Foodgawker or Pinterest.Wherever it was, it piqued my interest and went to the blog to look up the recipe. 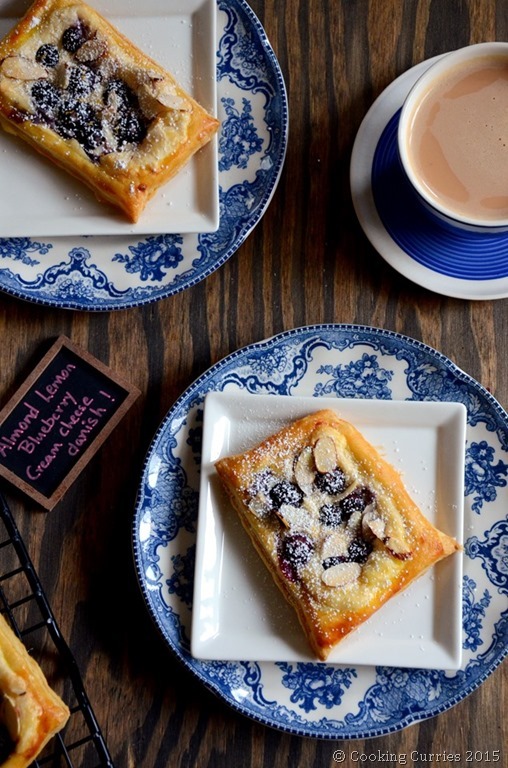 It took me to this lovely blog, Wanna be a Country Cleaver where there was a recipe for 20-minute Blueberry Cream Cheese Danishes. The photographs were lovely and the writing was very fresh and friendly. I was immediately attracted to it and spent some time going through some other posts, before coming back again to these danishes. I made a mental note to get everything I needed the next time I went grocery shopping. We usually have all kinds of berries – blueberries, blackberries, strawberries and raspberries, as lil V loves them a lot. He has even started saying Sa-sa for strawberries, which we find to be really adorable. It is the only other fruit he differentiates when he says, everything other fruit is aa-pl for him. I didn’t want to steal from his collecttion of fruits, so I went ahead and bought a box of blueberries just for this. I knew I had puff pastry sheets and cream cheese spread. And of course, like with any other recipe, I could not stick to the original recipe. I had to make my own additions to it. I immediately thought of adding some lemon zest to the cream cheese mix. I have had a lemon blueberry cake before and liked how the two flavors mingled together. I don’t like my desserts to be lemon-y but just a hint of lemon is not all lemon-y. Right. As I was adding the almond extract, I thought why not add some sliced almonds that I had in the pantry for that little extra crunch in the center. Turns out, that extra crunch was really good. We loved it! This recipe needs the minimum ingredients for a dessert and can be made in a jiffy. 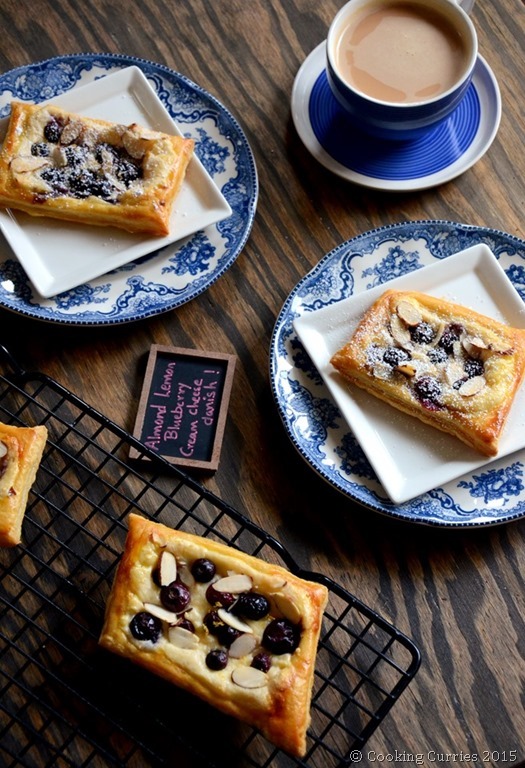 Puff pastry, cream cheese, sugar, vanilla, almond extract, almonds, blueberries, lemon zest, a little egg wash and you are all set! The best part is that, all these ingredients are those that you usually will have in your pantry/freezer. It also takes very little time to put it together and make it. You can also make it for a large group too. And it will look as if you put a whole lot of effort and slaved all day in the kitchen. Thank you Megan for putting this recipe up on your blog! Dust some flour on the countertop and roll out the puff pastry sheet. Cut the sheet into rectangles roughly 5X3 inches. Whip the cream cheese, sugar, vanilla, almond extract and lemon zest till smooth. 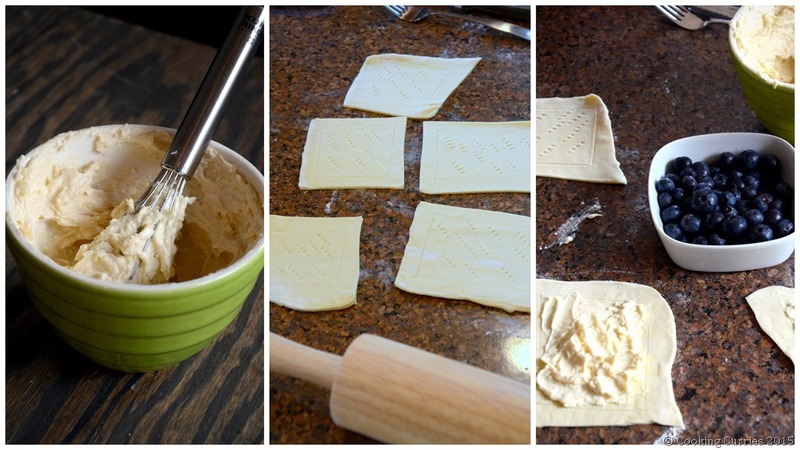 Spoon this to the center of the pastry rectangle and spread within the borders. 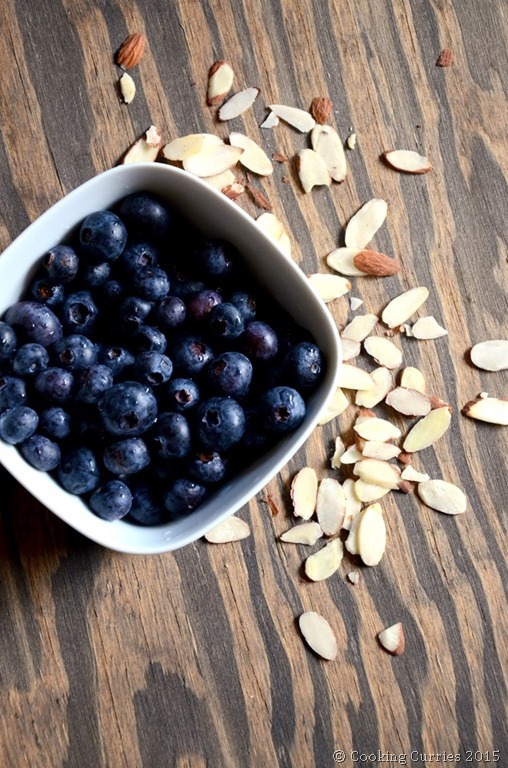 Place some blueberries and almonds and press them a little into the cream cheese. Make an egg wash by mixing the egg with a little water and brush this on the edges of the pastry rectangle where there is no filling. Place on a baking sheet lined with parchment paper and bake for 20-25 mins or until the pastry becomes golden brown. Cool on a wire rack and serve immediately. If serving later, it is best if not reheated. Well, I confess I am really baking-impaired, but you’re right, this doesn´t look hard at all! And it’s perfect with coffee. I am sharing the recipe and you just convinced me to get my baking act together! I am glad 🙂 Thank you! Wow, not only do these look delicious but they sound delicious too! They look so delicious and petite! 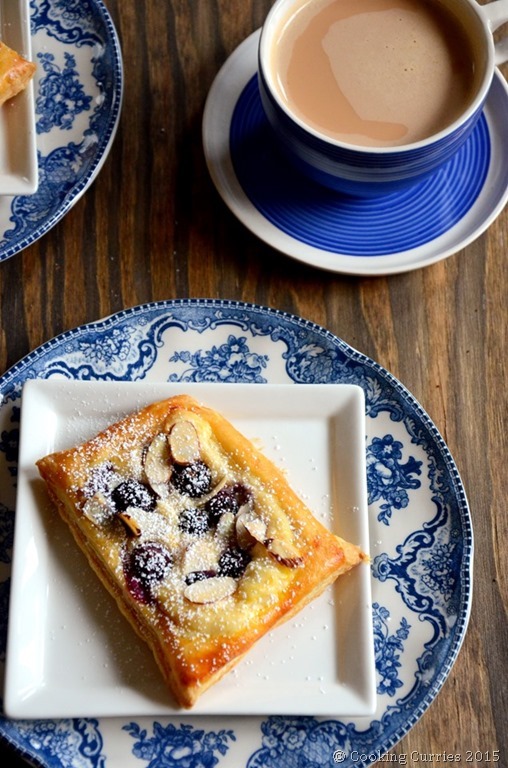 I love Cheese Danish and Almond-blueberry combination sounds so good. I’ve never made a danish before! Part of my 2016 goals is to try new things and this will be one! 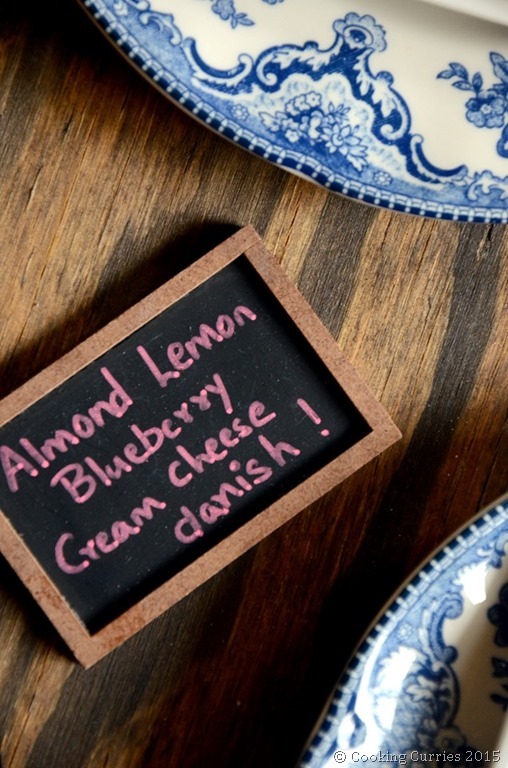 Cheese and blueberries – yes please!! !